Margo Kelly: I Have an Agent!! WAHOO!! I Have an Agent!! WAHOO!! Hey - don't judge me just because I look like a chipmunk! I was a little excited! Merry Christmas to ME! 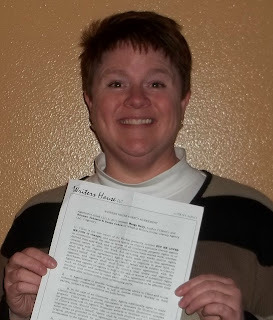 I signed a contract with Brianne Johnson at Writer's House Literary Agency!!! I guess that wall-of-revisions (see post from a few days ago) really paid off!! But, maybe I should have put some make-up on before taking this picture. Sheesh! YAY ME! WHOO. Fantastic Christmas news! Not to mention an amazing agency. :) Huge congrats!! Hey, congratulations, what a wonderful Christmas present! Congratulations, what a great early Christmas present. Well done!! Oh happy dance. Go girl you deserve it! Thanks for all of the congrats!!! High five from across the country, Margo! Way to go! no way!!! SQUEEE!! So, so, so, happy for you! So excited for you!!!! You so deserve it! I've probably this a million times in all our back and forth emails this morning, but wanted to say it again here...CONGRATULATIONS! YOU'VE EARNED THIS THROUGH ALL YOUR HARD WORK!!!! Wow! Wandered over here to repay your visit, looking for the Deja Vu fest and saw your news! 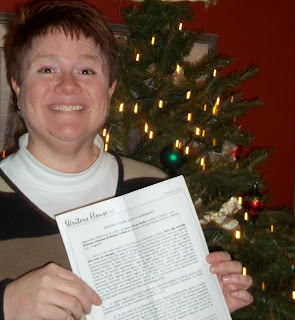 I signed with my agent last December, so I am celebrating for you with nostalgic delight! Congrats!!!! Yayyyy! So excited for you! Congratulations, Margo!!! What a Christmas present!! Why shouldn't you look happy - it's great news, congratulations! Glad you took a picture with the big, happy smile. Congrats!!! I just hopped over from the blogfest and saw your news! So happy for you! Congratulations!! Wahoo! A dream come true! Congrats!! Wow! Congratulations! Early X'mas present! That should make your Christmas! Hearty congratulations! How wonderful! Best christmas present ever! Best of luck as you enter this new phase of your career! Margo, that is awesome! Congratulations. And you don't look like a chipmunk. That's an incredible accomplishment! Congratulations Margo! AWESOME!!!! I'm soooo happy for you!!! And it's really nice to know we announced the same day! Margo, you did it!!!!! YAY!!! I'm so glad I popped over to share this awesome news!!! So so happy for you! Can't wait to hear all about it. Is this for the same story you've been shopping around or a new one??? Congratulations - that is a GREAT day! Congratulations!!! And you look beautifully happy. OH yes, Merry Christmas to you! Congratulations. Nice meeting you from the DejaVu blogfest. Fantastic! I'm happy for you. Thanks for coming by to see me. Your previous post was interesting too. Everyone has their own style of writing and I think you should just go with that. It was interesting about the 'being' verbs. Wonderful wonderful, God bless you. I now you will have a happy Christmas. Mazel tov on getting an agent! Discovered you via deja vu blogfest as well, nice to meet you! Congrats and good wishes for the season! I'm a bit late to the party but, Whoo-hoo!!! That had to feel ASTOUNDING! Congratulations! 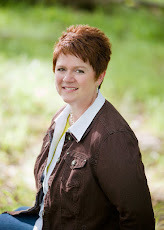 A late congratulations, and a thank you for stopping by my blog during the Déjà Vu Blogfest last month! First of all, you do not look like a chipmunk in those photos -- you look adorable and happy. Secondly, congratulations! What a joyous event right at the holidays. Do you mind if I ask how your experience has been with Ms. Johnson, so far?